When it comes to home office design, your lifestyle and the space you have available make all the difference. With a few creative home office ideas, you can integrate your office into your home. Many home offices have limited square footage, which just means you have to organize your space efficiently – both vertically and horizontally. Using your wall space helps get papers and office equipment off the desk, yet allows you to keep important papers and office tools within arm's reach. Think about your current storage needs, and then consider how those needs may change over the years. Will toy shelves one day display books or picture frames? Make sure the storage pieces you buy will house what you already have, and can easily accommodate additions. Both open bookshelves and modular storage allow you to change the home office furniture arrangement as your needs change, or as your role changes. Perhaps you’ll find that you pace during conference calls, or you telecommute more often than you expected. With modular storage like the Compass Tall Wood Double Display Cabinet, you have the flexibility to use each space for books, knickknacks, or baskets of odds and ends. Your furniture can’t anticipate your needs, but it can have the versatility to adjust for them. There is a different type of home office desk for anything type of work you might want to do at home! Various styles and footprints can fit your needs, depending on whether you have a laptop or a desktop computer, and how much space you have. A corner desk like the Commonwealth Corner Desk Set combines storage and function, and also provides extra leg room. A writing desk like Bassett Furniture’s Storeroom Modular Desk has a smaller footprint that integrates well into a quiet corner, or can sit behind a sofa. A credenza, which is a desk with an attached cupboard, and works well in dining or living rooms. An executive desk has larger dimensions, incorporating a large work surface and storage. The scale of these desks makes them ideal for a dedicated home office. Your home office furniture arrangement is so much cozier than a cubicle. For a dedicated home office space that only sees occasional use, mixing in upholstery is one way to help the room get as much use as possible. Adding two small chairs or a sleeper sofa creates guest seating and also allows the room to do double duty as a guest room. Do you work with clients in your home office, share the office with someone else in the family, or help out with homework or household tasks? 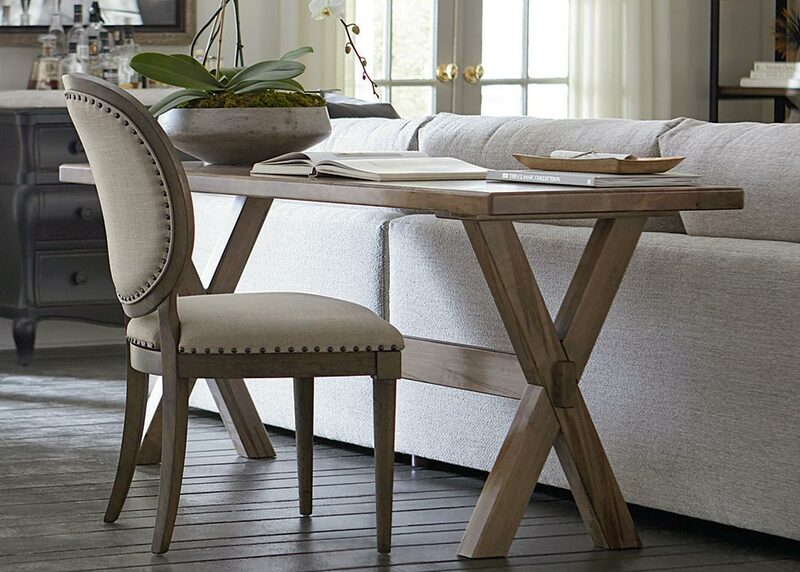 An upholstered dining chair makes a great solution for extra seating. Consider your workflow and what items you need to have close at hand before selecting home office furniture. Then look for pieces that are functional, but reflect the rest of your living space. If your home has contemporary decor, artistic pieces or modern metal furniture are ideal. If your home is traditional, your home office might feature warm wood and soft, comfy chairs, or even a loveseat. With thoughtful home office design, your work day can be the best part of the day. 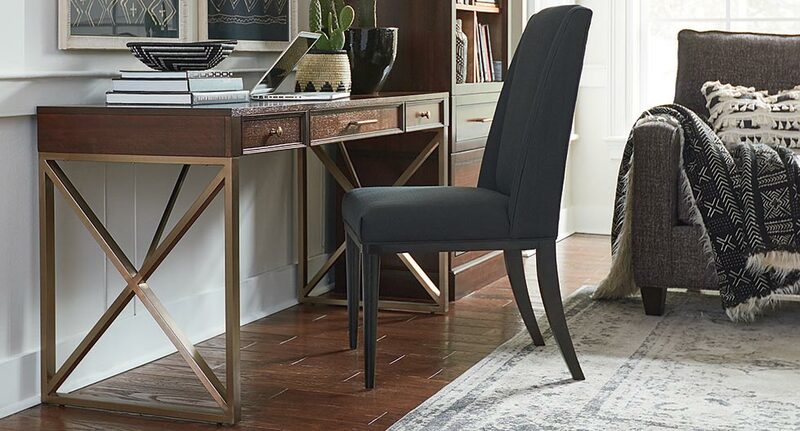 Whether you’re looking for a desk, storage, or bookcases and open shelving, shop the Bassett Furniture collection and start making your home office design ideas a reality.